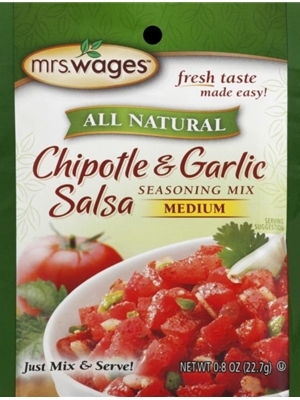 Smoked Jalapeno chilies and savory minced garlic combined with traditional southwestern spices to create a warm and flavorful salsa seasoning in Mrs. Wages Chipotle & Garlic Salsa Seasoning Mix Medium. 0.8oz. Combine mix contents with chopped tomatoes or can of diced tomatoes. Let stand for 10 minutes before serving, or cover and refrigerate until ready to use. DEHYDRATED VEGETABLES (CHIPOTLE PEPPERS, GARLIC, ONION, GREEN BELL PEPPER, JALAPENO), SALT, SPICE, MALTODEXTRIN, EXTRACTIVE OF GARLIC, NATURAL SMOKE FLAVOR.